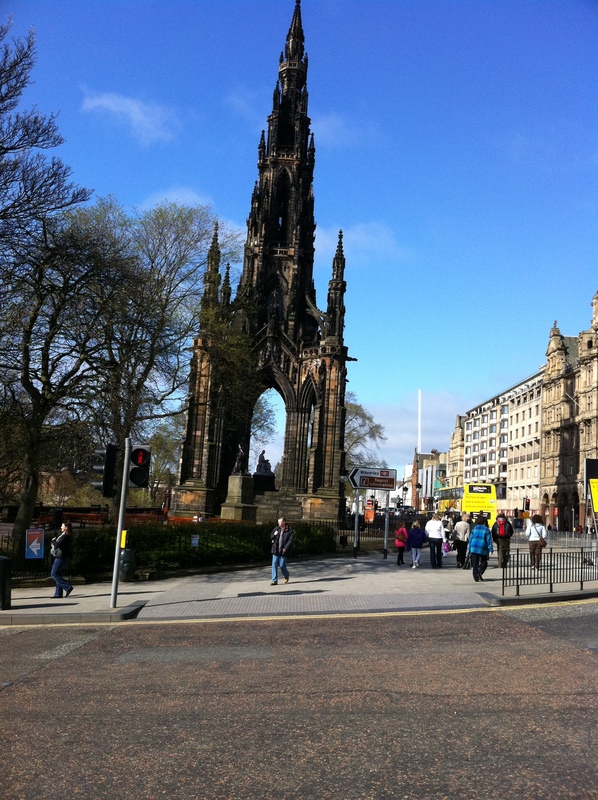 I spent a couple of days in Edinburgh recently, enjoying the Book and Fringe Festival. It’s become a regular part of my summer to spend a couple of days there, and I always wish I could stay longer and see more. I picked some wonderful events at the Book Festival this year. There was an event I was interested in just about every day, but I cherry-picked those that would allow me to travel there and back in a day and made the most of the days I was there. Phillipa Gregory, who writes historical fiction, and is most well known for The Other Boleyn Girl was an interesting and intelligent speaker. She immerses herself in history, taking around a year to research each novel. Listening to her made me reflect how much of my own knowledge of history comes from reading fiction, rather than academic works. I reckon Jane Austen taught me as much about Regency England and its manners as Charles Dickens educated me about social inequalities in Victorian London. These places and time periods become very real to me through the fictions of the time. And that continues into the modern day, with writers like Ian Rankin showing contemporary Scotland through the eyes of Rebus and Malcom Fox. Philippa Gregory admitted that she didn’t read historical fiction, saying “I read history, so you don’t have to.” Her work has certainly helped me understand the Wars of the Roses better than any text book ever did. She also revealed how inspiration for her book The Other Boleyn Girl came from reading about Tudor shipbuilding and finding a reference to a ship called the Mary Boleyn. Proving that no research is ever wasted, she finally got to write about those Tudor ships in her latest book. But my trip wasn’t all history and fiction. I spent a very educational hour in the tent with David Crystal. David is a linguist and well known for his many books on the English language. His text books formed the core of my English Language studies at University. He was talking about accent and dialect and some of the wonderful lost dialect words in the English language. As with most people who are enthusiastic and really know their subject well, he was amusing, entertaining and taught his audience something new. He was assisted by his son, Ben, an actor, and together, discussing accents, they made a great comic double act. I left feeling just as excited about their non fiction work as I did about the piles of fictional books I longed to take home from the bookshop. Since I came back, I’ve always had a book on the go, and find myself seeking out time to return to their pages. As always, I was inspired by my visit to Edinburgh. I think that’s important, to have people and places that encourage me to look beyond my every day experience and to fire up an interest in learning more. Reading provides fuel for the brain and in Edinburgh at the book festival I am surrounded by fellow readers and inspired by writers. It feels like I am with my tribe. I have travel on my mind at the moment. Unlike many, I’m not planning on jetting off on a summer holiday soon, but I am planning a few day trips, including time in Edinburgh. In a couple of weeks’ time, I’ll be indulging myself at the Book Festival, and the Fringe. I have tickets for a few events and for the rest, will take the approach of turning up to see what I can get into. I love spending time in Edinburgh. It’s far enough away to feel like an adventure, but not so far that I’m in danger of jet lag. There always feels like there’s lots to see, do and explore, no matter how many times I’ve visited. I generally walk my feet off getting from place to place. I really enjoy the way the city wears its literature. It’s inescapable. From the Writer’s Museum to the Storytelling Centre; from the book festival to literary walking tours and pub crawls, you cannot avoid the fact that this is a Unesco City of Literature. Many locations, street names and areas are familiar to me from reading. 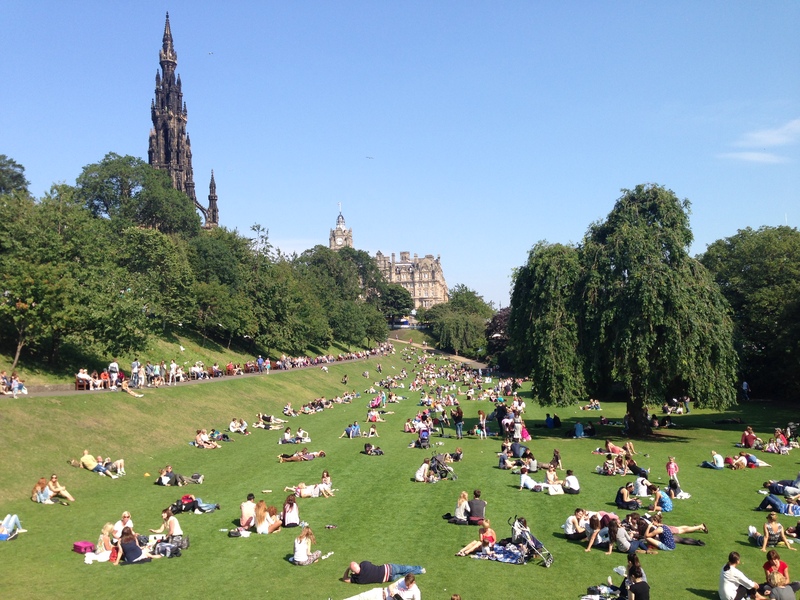 From Walter Scott to Alexander McCall Smith, Muriel Spark to JK Rowling, it’s been home and inspiration to many writers. 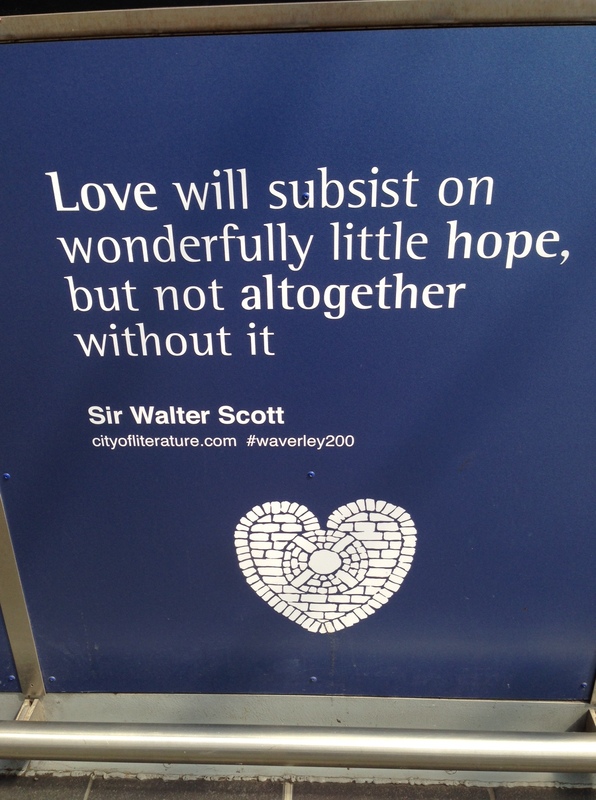 When I step off the train at Waverley, I half imagine I’ll meet some of their characters as I explore. I swear one day, I’ll see Rebus somewhere about town. Even if you were unaware of its literary connections, words pour out onto the streets. 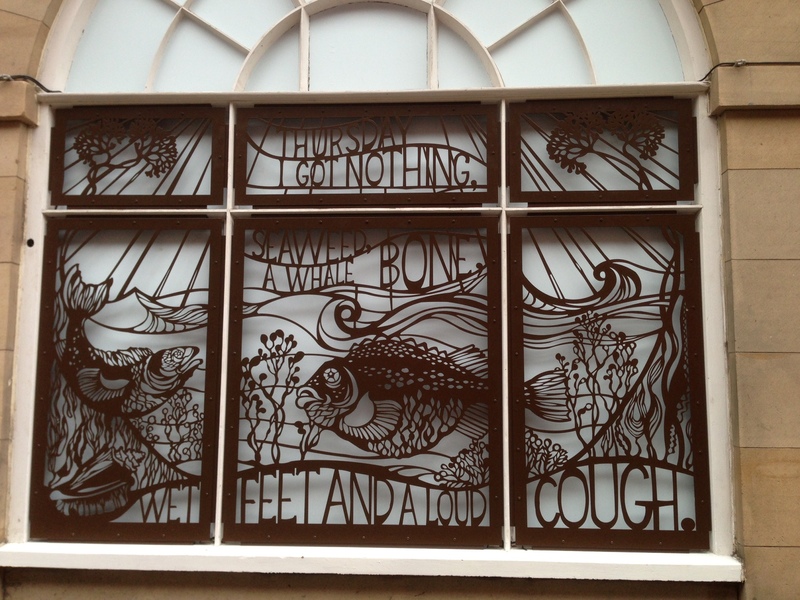 You’ll find them etched on buildings, woven into window frames and hidden among the street furniture. It’s like a secret code that speaks to readers like me. It makes me smile as I encounter a poem that others pass by and never notice. My last visit there introduced me to a beautiful poem, November Night by Scottish writer Norman MacCaig, that I discovered on the side of a planter. In the height of a Scottish summer, it reminded me of the realities of its winter. “The night tinkles like ice in glasses. Leaves are glued to the pavement with frost. I wish more cities did this kind of thing. Poetry as part of the landscape is far more appealing than when it’s stuffed into study books. It’s unlikely that I’d have found this verse and its companions if I hadn’t chanced upon it. And I feel richer for it. 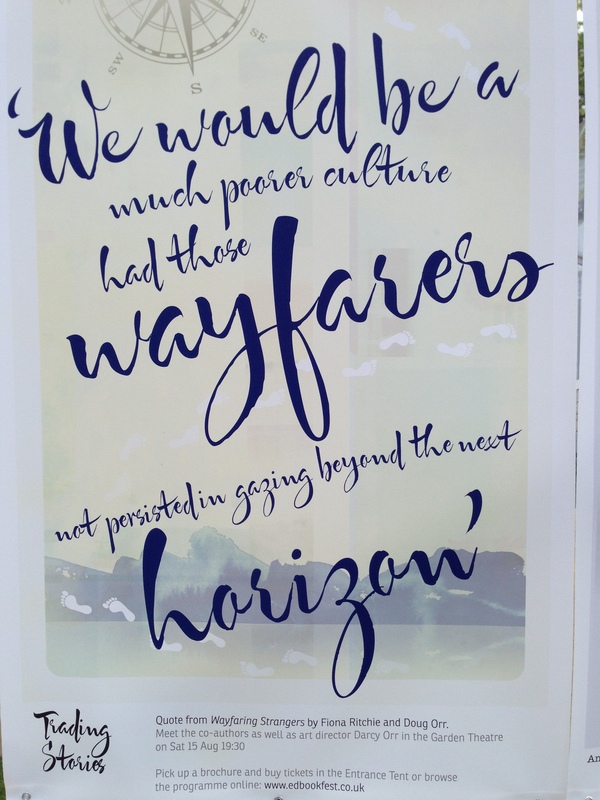 As I visit again this summer, I’ll be on the look out for more words on the street. 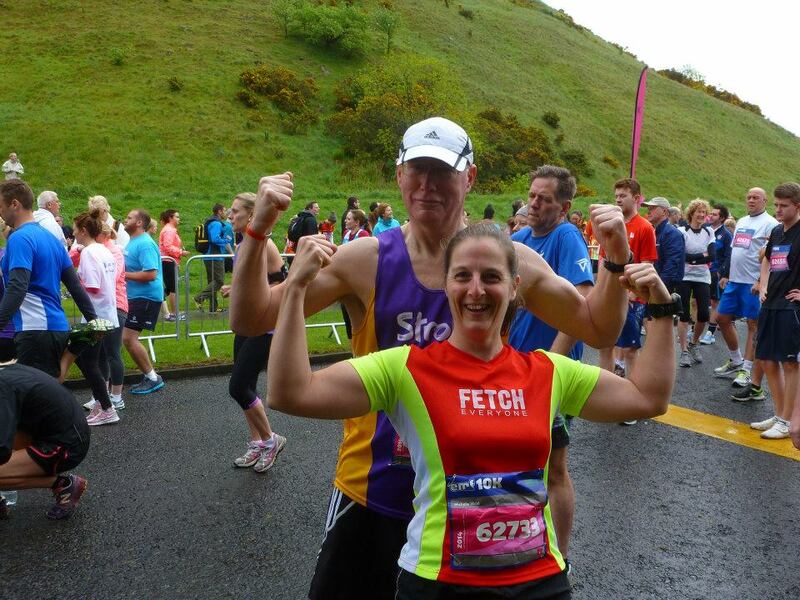 It’s thanks to online running site Fetch Everyone that I saw a message offering a free place in the Edinburgh 10k. The same site that introduced me to my great friend Lesley who hosted me for the evening, got me to the start and looked after my bag. And it’s thanks to Fetch that I got hugs and smiles and a local’s low down on the route from the fabulous JaneyM and my old pal Scotty. I have lot to thank Fetch for, but running this amazing route with views out over one of my favourite cities in the world is definitely among the highlights. I’d go back and run that route in a heartbeat, even with the hills. I’d taken a half day off work on Friday, rattled through what I needed to do, desperate to get out of the door and on the road north. It pelted it down with rain. I grabbed a sandwich on the go and tried to dissolve the feeling of stress that sits in my chest when the pressure’s on and I feel like I have no time to think and reflect. The skies had cleared, but were still grey and chilly when I arrived at Lesley’s place, still wired and tired from rushing through my day to get there. She said ‘You’re on holiday now,’ and I was. We talked ten to the dozen, went for a bit of a drive, ate cake, and hung out. Stress gone. Later I met Danni, a crazy bundle of enthusiastic energy, also taking advantage of Lesley’s hospitality before a mental sounding mountain bike race. Fuelled up for our exploits, it was an early night for all before alarms were set for racing. I really had no expectations for this 10k. I kept saying I just wanted to go and enjoy it, and I meant it, but sometimes the best made plans get lost in the heat of the moment, chasing for a time. But really I had no excuse not to be relaxed. Lesley drove us up to Edinburgh, knew exactly where to park for a short walk into Holyrood Park. Walking in was wonderful, getting a close up view of the crags of Arthur’s seat and the yellow gorse on the hills. Did I draw strength from the volcanic rocks, the tough organic heart of this majestic city? 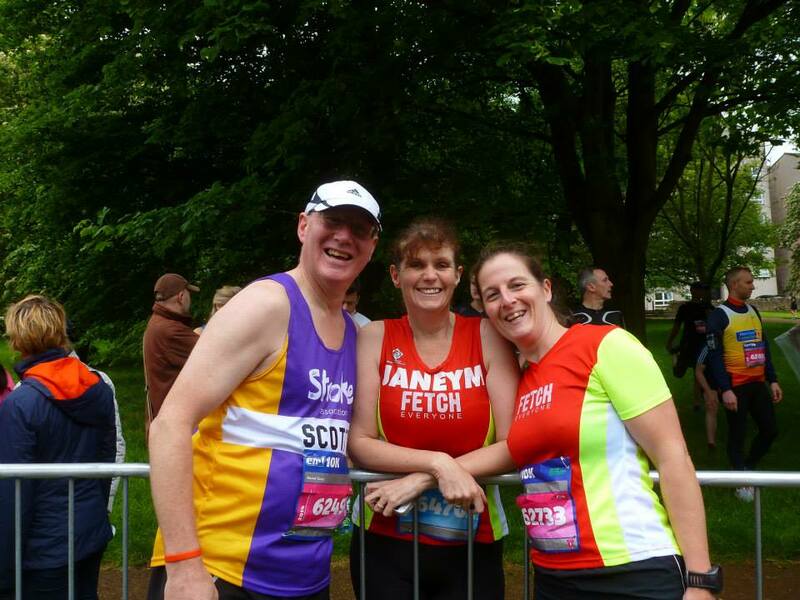 Or from my friends, the amazing Janey fresh from ultra marathon glory, or Scotty who fooled around and made me laugh before the start? A bit of both, I’d say. I felt bouncy and fresh as I warmed up. It was overcast and cool, but not windy – perfect running conditions. So when our time came, I bounded off picking through the crowds trying to find space, heading out much too fast for the hill that was to come. Scotty came through past me as I started to bring my enthusiasm into check just before the 1km marker and the turn to mark the start of the climb. His local knowledge and talking me through the course really helped as I reckon that’s the longest uphill drag I’ve ever run. I knew there was a false top, and then another steep bit and then that would be it as good as over. I dropped my pace, but tried to keep up the effort. Small steps, breathing easy, not looking too far ahead, just keeping moving, not pushing too hard. There were people walking already. I told myself I was a long way off that and kept going. The steeper section almost got me, but I took some deep breaths and kept on moving, determined to run every step of this one if I could. The blessed relief of an enthusiastic cheering point at the top and then a good stretch of downhill where I let go and picked off runners by the dozen as I descended, trusting to my feet and my core muscles to keep me upright. And the views? What views! Even on a grey day, to see the city laid out beneath you, climbing the crags, feeling like you can touch the sky, gave me a very special sense of being connected to the elements of rock, earth, water and air. It was well worth the effort of climbing. As I ran there, I sensed this would be a place I’ll return to in my dreams. I was running to feel, enjoying the cool air on my skin, pushing on when I felt good, easing back and giving myself space to breathe when it got harder. At 5k I glanced to see 30 minutes on my watch and felt that was fair, given the terrain. I had a dip in energy levels just after that, feeling the effort in my legs and for a few seconds trying to force more pace from them as a crowd of runners surged past. But then I let it go and just cruised until the feeling came back again and I felt free to run, stretch out and enjoy. Along the flat path of the innocent railway shaded by the trees, I began to play reel them in, latching onto the back of one runner and drawing myself past them, then spotting another and going again. At the end of this stretch was another tough rise, steep and unforgiving on tired legs. I started well, controlling the effort, shortening my stride, but it became a shuffle. As others walked I hunkered down, used my arms and determined not to walk a step, even if I was moving at barely more than walking pace. My calves were tight. I got a twinge in my knee. And I swear I could have accurately placed the tibialis posterior on my right leg. I could feel it spiralling all the way up from the inside of my foot to my knee. If I’d felt like I’d been holding back a little on the run before, I was glad of it now. At Raby Castle 10k last week, I’d talked myself up a stiff climb, then struggled at the top and found myself walking on the flat which was irritating. My legs had more strength or my mind had more staying power this time and I kept on moving, gathering my breath, ready for the much anticipated downhill sweep that would bring me back round towards the finish. Swooping down and round, overtaking runners as I descended into the last kilometre, feeling my legs flying free and trying to carry that speed into the final straight. Still I was holding on, reminding myself that the finish was further on that the start line, not wanting to blow up completely before the end. Picking a spot to sprint from and going a little early, but powering on as others around me kicked for the finish. Oh how I do love a last minute sprint! Over the line and stopped the watch. You could tell I hadn’t glanced at it since 5k. My time – 1:00:06. Six seconds over the hour. And there’s the real test of how much I enjoyed this run. There was a milli-second of annoyance, so close but not under the hour. And then a laugh at myself, because this was never about time, it was about the experience. The experience of testing legs, heart, lungs and brain over ancient rocks and trails. The experience of running in one of my favourite places in the world with some of the best people I know. The experience of being a runner, being able to do this, being alive and well and conscious of every amazing sensation. I’ll take six more seconds of that any day. Last week I replied to an offer of a place in a standard or Olympic distance tri in return for blogging about it. I was excited and nervous in equal measure about taking on an event that doubles the distance that I’ve done so far in all three disciplines with only 3 weeks to get ready for it. But since then, despite an assurance that I would hear on Monday, I haven’t heard anything more about the place. So I’ve decided it’s off and I’m taking the pressure off trying to fit in lots of tri training and will switch my focus to running and get back to the Great North Run and fundraising for my chosen charity. I’m a bit disappointed. Mentally I was up for the challenge and people had stepped in to support me. Ian had put together a tough, but manageable training plan and was filling me with encouragement in our training sessions. Peter had suggested an open water swimming session I could get to and Lesley and Al had told me to go for it. Friends had offered accommodation and I was getting as set as I could be. And it would have been a good story, wouldn’t it? A bit of drama and challenge. Part of me has been tempted to look for another standard and do it anyway. But they would involve quite a bit of travelling and expense and I’d have the additional stress of being there on my own. I already have the promise of racing my first standard distance next year, in the company of great friends, so I’ll stick to that and look forward to a great event. Does that make me sound like a glory hound, that I would like someone to be there when I do something that for me, would be a significant challenge? Maybe I am inspired by an audience, my own Olympic stadium cheering me on. But I also know I’ve had the best fun at races where I’ve had friends around me. On a positive note, it’s shown me that actually I can do this. And that I really want to. I’ve got some really decent training in, particularly around my swimming which I’m very much enjoying at the moment. And I’ve got back on track eating clean, resting well and training hard. 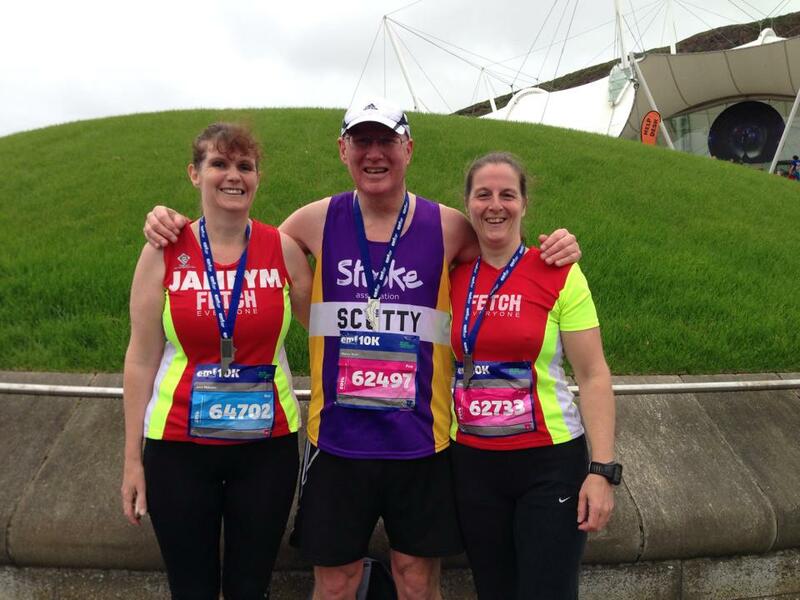 But now I can get my mind back to the Great North Run and do another long run in this weekend. And I can go have some fun. Starting with a trip to Edinburgh, to run, to see some friends and to enjoy some festival shows. So I’m not looking at it as a DNS (did not start), it’s a start having fun and seeing what I can do at half marathon again. It’s been an amazing week for triathlon as it’s made headlines and front page news with British success in the Olympics. I really enjoyed watching both the men’s and women’s events and in particular hearing Chrissie Wellington working for the BBC and pouring out her obvious enthusiasm for this multi-sport event. Seeing Alastair and Jonny Brownlee winning medals in London was thrilling and the close finish of the women’s race was simply astounding. These are the elites of the sport and their performances are stunning, but I hope people haven’t been dissuaded from giving it a try by the quality of performances. Because there was evidence too, even at this elite level, that this can be a friendly and supportive competition. Triathletes like the Brownlee brothers compete and train together, making them a formidable force in the sport. But the first thing Alastair did after crossing the line to win, was to shake hands with Spain’s Javier Gomez, who took the silver medal. In her book ‘Life without Limits’, Chrissie Wellington tells of her second World Championship Race in Kona where she suffered a puncture on the cycle leg and a malfunctioning gas canister used to inflate the replacement inner tube. She was effectively stranded until rival competitor Rebekah Keat passed her a spare canister of air. Chrissie went on to win the race. And that’s been my experience of triathlon. Luckily I’ve not yet suffered a puncture or wibbled jelly-legged over a line. But I have been encouraged, supported, advised and cheered on by many others in the sport, before, during and after my events. And I’ve had a lot of fun supporting others too. So, if you’ve been inspired by the Olympics and want to give triathlon a go, I’d definitely encourage it. You don’t have to start with the distances the Brownlees or Chrissie Wellington do. I haven’t even got there yet. But if you like running, swimming or cycling, I’d ask why not add another sport or two to your mix? Competing in multi-sport events multiples the buzz you get from doing just one. And really, it’s not as hard as it looks. The sun shines and our eyes turn upwards, a spring in our step and a lightness of heart. Settling into my seat on the train instead of my office chair and watching the beautiful Northumberland coast tumble past my window. Green and gold with the volume turned up to 11. Then a splash of deepest blue. Arriving in one of my favourite cities, navigating the scaffolding in the station, to emerge blinking into the sunlight to the sound of the pipes on Princes street and Scott’s monument. You Scottish people know how to honour a writer! Navigating the busy streets up to the Royal Mile, peering in the brightly painted shop windows, but hurrying on to make a meeting. Passing a Rankin landmark and thinking of Rebus. Spotting the close and venturing into a cool cobbled courtyard, immediately a million miles from the hustle and bustle. Then up, up, up into the attic space and exposed beams of a writer’s garret. A bolt hole in the city. And hours pass quickly, talking about words and movies and books with someone who gets it. And who will make me work even harder at finding the right ones. Someone to challenge the easy flabbiness and lazy acceptance. Someone who wants to make me write better. All done and released back into the sunshine to venture back into the crowds and practically sprint the length of Princes Street to greet a vision in pink. Lesley is waiting for me outside the National Gallery and I get a full on hug, almost getting swept up into a hen party in the process. Well they were wearing pink cowboy hats! Off to a nearby coffee shop for sandwiches and lots of chat about swimming, running, races run and races planned. And before we knew it, Alastair arrived, ready for more coffee, cake and chat. I have so many great days to look forward to. My first triathlon, new events and old races in wonderful countryside. It’s always good to catch up with good friends and this was a chance to enjoy some time with two of the very best.